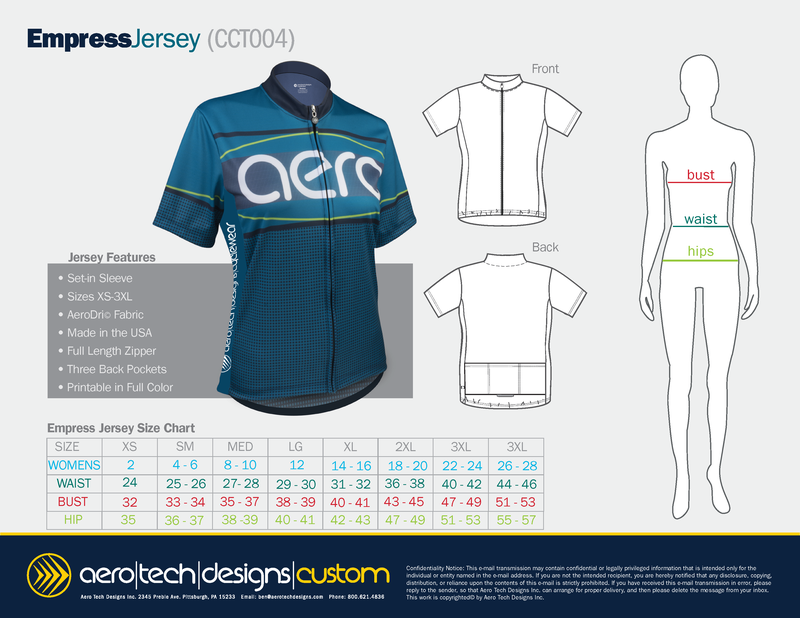 Aero Tech Designs Custom introduces the Women's Empress Jersey. You will feel like a goddess wearing our women's cycling jerseys because that they are made specifically for the female cyclist. The cut is contoured to a women's shape and needs. Designed to look flattering on and off the bike. Constructed from moisture wicking polyester, the fabric is a luxury soft that is engineered to transport moisture away from the body and into the outer layer of the fabric for evaporation. If you are a woman cyclist and you love comfort and performance you will love the Custom Printed Woman's Empress Cycling Jersey! Vivid Color! Aero Tech Designs can create amazing designs for your team! Great fit, standard full zipper, generous sleeve length, high quality fabrics, tall and big sizes, and more! Endless possibilities of color, text, logos, and design elements on your back. Choose from a selection of pre-made templates in our Semi Custom Design tool!